Is the ECO Pakistan’s key to economic salvation? On March 1, Islamabad hosted the 13th summit of the Economic Cooperation Organization (ECO), a regional intergovernmental economic organization in which all of the ten member countries — Pakistan, Afghanistan, Azerbaijan, Iran, Kazakhstan, Kyrgyzstan,Tajikistan, Turkey, Turkmenistan, and Uzbekistan — participated. High-ranking officials from these countries gathered together to reaffirm their aspirations of fostering integrated and sustainable economies through regional connectivity. The summit stressed greater collaboration in the areas of trade, energy, and infrastructure development. Pakistan, sandwiched between India to the east and Afghanistan to the west, has seen those two bilateral relationships largely marked by security reservations and grievances. Against that backdrop, the significance of the ECO summit in Islamabad (underscoring economic connectivity and collaboration) cannot be understated. Besides the participation of the five Central Asia republics, the convergence of regional heavyweights from Iran and Turkey and China’s participation further increased the summit’s significance. Below are five points from the ECO summit. After a spate of recent terrorist attacks claiming more than 100 lives in Pakistan, Islamabad continues to blame Kabul for not doing enough to stamp out terrorists who launch attacks across the Durand Line. Similarly Afghanistan also blames Pakistan for not doing enough to eliminate terrorists and militants that target Afghanistan. The longstanding accusations and counter-accusations of harboring terrorists thus continue. This cynicism also overshadowed the ECO summit. As a result, Afghanistan’s top leadership — President Ashraf Ghani and Chief Executive Abdullah Abdullah — did not participate. When exploring the significance of Pakistan’s search for regional economic connectivity, it is important to ask if Pakistan can really pick and choose regional partners with a continuous disregard toward the misgivings of the immediate neighbors. Although it is largely believed in Pakistan that the Afghan president may have been pressured by India to not give credence to the Islamabad summit, it should remain Pakistan’s top priority nonetheless to mend ties with Afghanistan and do so quickly. Otherwise, regional confrontation may blot Paksitan’s mantra of regional connectivity. At the Islamabad summit, the Turkish foreign minister said that the member countries of the ECO are rich in energy resources and Turkey is ready to transfer these resources on to international markets. The ambitious statement by the Turkish minister presents a welcome opportunity for Pakistan to further capitalize on its “excellent” bilateral ties with Turkey, which is arguably emerging as foremost Muslim power of the 21st century. To provide a lifeline of regional economic integration during the Trump era, Pakistan will need to explore ways to diversify its bilateral trade with regional countries. In this regard, enhancing trade with Turkey beyond defense ties will be crucial. 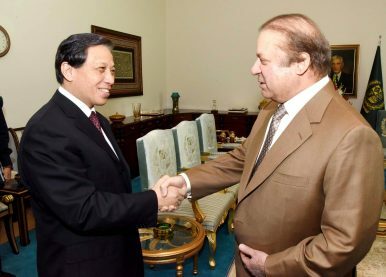 Although China is not a member of the ECO, Chinese Vice Foreign Minister Zhang Yesui participated in the summit on the special invitation of Prime Minister Nawaz Sharif. Sharif emphasized that theme of the summit, “Connectivity for Regional Prosperity,” converged with China’s “One Belt, One Road” project. In particular, the flagship China-Pakistan Economic Corridor (CPEC) initiative provides an opportunity to emphasize OBOR’s strategic benefits for the ECO region and beyond. Convergence between economic interests of Pakistan and China, which is emerging as a global economic superpower, is vital to Pakistan’s economic sustenance and viability. While Pakistan is not isolated in a real sense, China remains a significant economic lifeline. Although in a nominal way, several other leaders brought up their country’s particular concerns. Azerbaijan’s President Ilham Aliyev took up the issue of its Nagorno-Karabakh conflict with Armenia at the ECO summit. Similarly, in a meeting on sidelines of the summit, Iranian President Hassan Rouhani and Turkish President Recep Tayyab Erdogan discussed the issue of foreign “interference” in Iraq and Syria and broadly agreed on dialogue and mutual respect to settle differences. However for all the symbolic significance of the summit, Pakistan, the host, failed to highlight the Kashmir issue. Although Pakistan has been consistently highlighting its longstanding conflict with India at various international forums, it missed the perfect opportunity at the ECO summit, where heads of states and governments from majority of the 10 member states had gathered together. Islamabad scored a diplomatic failure, which signifies Pakistan’s continued weakness in rapport and leverage with regional countries. This is exactly what Pakistan cannot possibly afford at this time. As far as picking sides with Saudi Arabia or Iran is concerned, Pakistan has been walking on a tightrope of late. Relations between Pakistan and Saudi Arabia have been strained since April 2015 ,when Islamabad decided to categorically decline a Saudi request to participate in its coalition fighting in Yemen against the allegedly Iranian-backed Houthi rebels. While the participation of Iranian President Hassan Rouhani in the Islamabad summit marks a thaw between the two neighboring countries, it also intensifies a drift away from the kingdom. Pakistan needs Iran to ease its crippling energy crisis but at the same time it cannot afford to endanger its “brotherly” relations with Saudi Arabia. Hence Islamabad has to manage a fantastic diplomatic balancing act between a “brotherly” kingdom and a “neighborly” Iran. In this quagmire, Pakistan needs to pursue its economic and security interests tactfully and delicately so that Middle East’s sectarian wedge does not create rifts inside Pakistan, which is home to both the world’s second-largest Sunni and Shi’ite populations. Mahboob Mohsin is a freelance contributor. Follow him on Twitter: @MohsinMahboob. Why Sri Lanka? Why Now?Sri Lanka Blocks Social Media After Easter Sunday BombingsAfghanistan: Prospects and Challenges to Regional ConnectivityPakistan’s Economic Woes: The Way ForwardIndian Elections 2019: Do Narendra Modi and the BJP Deserve a Second Term?